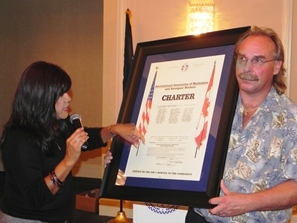 James Hott, President of Longhorn Local 811 and Transportation GLR Dora Cervantes display charter document for newly established Air Transport local in Houston, TX. More than 2,700 Fleet/Ramp Service workers for United/Continental Airlines have been assigned to newly-chartered Longhorn Local Lodge 811 in Houston, Texas. The new Local Lodge was chartered following the merger of Continental Airlines, Continental Micronesia and United Airlines and the IAM’s successful campaign to win representation rights for the combined airline’s Ramp/Fleet Service group.